Every team needs a guard who can get his own shot and every team needs a leader. 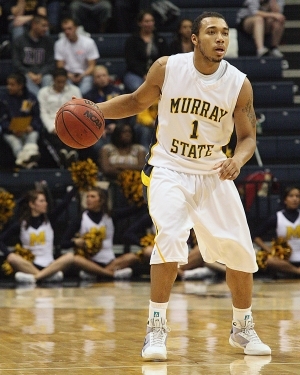 When B. J. Jenkins transferred from Liberty University to Murray State the Racers got both. On the court Jenkins is a deadly long range shooter who can also get his own shot off the dribble or create for his teammates. Through eight games he is averaging 11.4 points in just 24.9 minutes per game. Against California he hit 4-of-7 three-pointers and against North Carolina Central he hit 3-of-6. And when the game was on the line against Eastern Kentucky he asked for the ball and made the game winning shot. "I told them to get me open and I would make the shot," he said. "Jeff McClain and Tony Easley set great picks and then Isaiah Canaan put the ball right in my hands so I could get a quick shot off." Jenkins leads the team in assists with 35 and is third in the Ohio Valley Conference in assist-to-turnover ratio. Off the court he is the leader the team has lacked at times in the past. “After a lot of hard work to rehab his knee, I'm sure Jewuan Long was looking forward to playing in the season opener at California,” MSU play-by-play announcer Neal Bradley noted. “He didn't play a minute and he was naturally disappointed. "The next morning, as we were leaving for the airport, Long was the first player on the bus and you could tell he was not happy. The second player on the bus was B.J. Jenkins, who sits a few rows behind Long. For Jenkins, it's all part of being a good teammate. "I’ve been like that all my life,” he said. “I’ve been at the top and I’ve been at the bottom. I look at my teammates like my brothers. And I hate to see my brothers down. Jenkins' parents both played team sports. His father was a basketball player and his mother played softball. So being a good teammate comes naturally to him. “I was born into sports,” he said. “When I was a little kid I had a Fisher Price hoop in the kitchen. I would watch Michel Jordan and everything he did I'd try to do on the Fisher Price hoop. “I started playing youth league basketball in Virginia Beach, Va. when I was about nine. When I was 12, I played for Coach Dave, David Sneed. He was the first coach who really believed in me and that meant a lot. I still talk to him to this day. He's one of my closest friends. Jenkins went on to play basketball and football at Green Run High School. “I was a quarterback,” he said. “This one time I dropped back to pass and they blitzed me. So I ran toward the sideline trying to make a play. I didn't have anything and my momentum took me out of bounds. Well it was on the opponents sideline so no one tried to stop me. They just moved out of the way. I ran into the bench and my head got stuck between the seat and the back of the bench. It took them about 10 minutes to get me out. “I had recruiting letters from Syracuse and Tennessee but I quit playing football after my freshman year. There's just no feeling comparable to what you get on the basketball court.